Hibs eased past Aberdeen in their Scottish Cup third-round replay as they recorded their biggest victory over the Dons in 37 years. 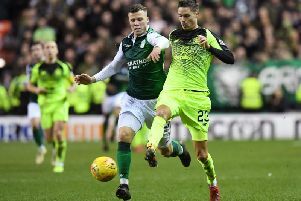 Despite going down to an early goal at Easter Road, Hibs found the cutting edge required to come from behind and end up emphatic winners after the teams had drawn 2-2 at Pittodrie eight days earlier. Dons boss Jimmy Calderwood sprung a surprise with the inclusion of Russell Anderson, the skipper having been declared a severe doubt pre-match due to a hamstring injury. His presence was required during an early spell when Hibs swarmed at the away defence. The game began to assume the aspect of a cup-tie when Aberdeen finally made it an end-to-end encounter after a spell of one-way traffic. Striker Stevie Lovell should have converted a cross from Darren Mackie but within a minute the former Dundee striker had played a vital role in opening goal. Barry Nicholson took possession on the edge of the box, played a one-two with Lovell, and then planted a shot past Andy McNeil. The very reason we were back at Easter Road had again made an impact on the tie. One suspected Aberdeen would struggle to preserve their lead on a night which had already produced an abundance of scoring opportunities. This assumption was proved correct within minutes. Another corner from Hibs, this time taken by Dean Shiels, was the source of danger, and Steven Fletcher’s header was this time presented with a clear passage towards the net. Hibs, with Michael Stewart preferred in midfield to former skipper Kevin Thomson, had chances to go ahead, but Aberdeen boasted territorial advantage as the half grew to a close. Their failure to capitalise on this made what followed more wounding. In the seconds before half-time Hibs again showcased how devastating a corner-kick can prove. Shiels picked out Stewart as he lingered with intent outside the box, and his volley, which appeared to come off his shin, dipped over Langfield and into the net. It was a goal designed for live television cameras. Stewart’s intervention was made more memorable due to the fact it represented his last touch of the match, with the player replaced at half-time by Thomson. Striker Abdessalam Benjelloun also came on for Shiels, with the Hibs shape shifting into a more orthodox 4-4-2 formation. Neither the interval break nor the change in personnel served to disrupt a team buoyed by Stewart’s departing gift. It was a challenge that looked utterly beyond Aberdeen after just ten minutes of the second-half had elapsed. By this stage Benjelloun had wreaked havoc, with the Moroccan substitute scoring just two minutes after he was introduced. Thomson and Fletcher combined on the left, and the latter’s intelligently-played ball found Benjelloun in an alarming amount of space. His instincts were found to be sharp, and after side-footing Langfield the striker simply rolled the ball into the net. It already looked a desperate situation for Aberdeen, but Benjelloun simply deepened their misery with a second after 55 minutes. Langfield looked suspect when seeking to deal with a Benjelloun shot from the edge of the box. While well-struck and on target, it had appeared blockable. Langfield, however, allowed the ball to slip through him, and through these same hands went Aberdeen’s chances of remaining in the cup. Hibs: McNeil, Whittaker, Stevenson, Hogg, Jones, Stewart, Beuzelin, Brown, Shiels, Sproule, Fletcher.